← Dirty Tactics or Constructive Criticism? Here we have another dish from our Summer in Capri to make your mouths water. This is a real fishy affair. 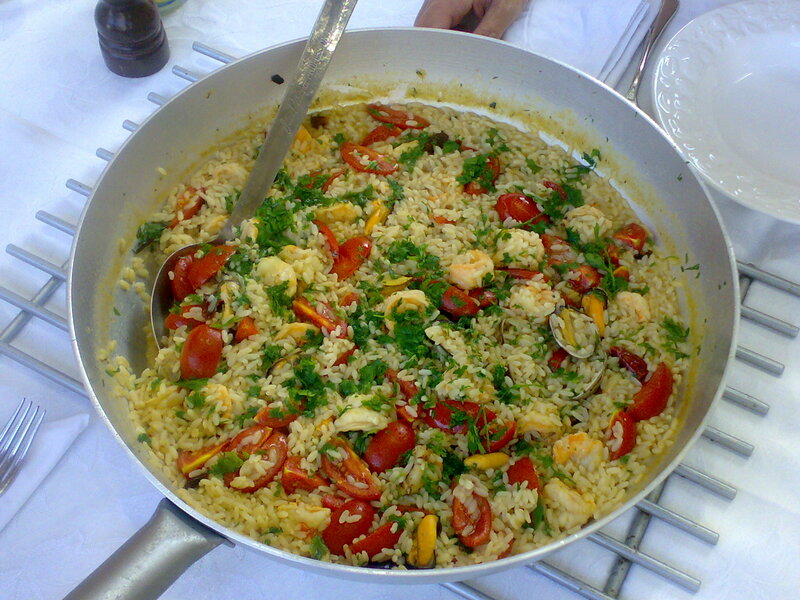 Risotto with fresh tiger prawns, freshly caught clams in their shells, calamari (you’ve guessed it, fresh), mussels and freshly picked cherry tomatoes. Finished off with lots of fresh parsley. Those of you that have made risotto will know it is a labour of love that you can’t just leave simmering in the pan or you will come back to burnt offerings! This was perfectly cooked, moist and a true taste of the sea. Another Costanzo masterpiece and my favourite! Depending on what fresh seafood is available, Costanzo will occasionally recreate this dish in The Caprese with the clams already out of their shells which is just as delicious and less messy for our customers! This entry was posted in Delicious Dishes! and tagged food, fresh, seafood. Bookmark the permalink.